In this post, we’ll share an overview of Advanced Placement exams, we’ll take a look at the AP Chinese Exam and its components, and we’ll share grading trends. Then we’ll look question by question at the exam, describe what to expect, and offer tips to maximize your score. Finally, we’ll share some advice on how to best prep for the exam. So if the AP Chinese and Culture exam is in your future, read on! What are AP exams, and why should students take them? Advanced Placement (AP) exams are standardized exams developed by The College Board® (the educational body which also administers the SAT test). Administered in the U.S. and Canada, AP exams test a student’s knowledge of college-level curricula. High school AP courses are designed to prepared students for the AP exam towards the end of the year and the exam is a standardized way to confirm a student’s mastery of a given subject. Why should a student take AP courses and AP exams? High school students should consider taking AP courses and exams for two key reasons: first, admissions boards of competitive universities like to see high AP scores on student transcripts — it demonstrates that a student is prepared to succeed in college-level academic courses. Second, high scores on AP exams often count as college credit, depending on the university’s policies. In addition, 35 states now participate in the Seal of Biliteracy program and award students special recognition on their high school diploma. Criteria for awarding the seal differ by state, but often a high score on an AP test is one way students can qualify. How are AP tests scored? Who grades them? All AP test takers are awarded a score between 1 and 5, with 1 meaning “no recommendation” and 5 being “extremely well qualified” — the highest score a student can earn. AP tests are scored by graders, called “readers” hired by the College Board, in order to ensure that the grades are consistently calibrated. AP readers are selected from high school AP teachers and college instructors and attend “AP Reading Week” in June, when all AP exams are graded. Lili Wong – an advisor to PandaTree’s AP Chinese Prep Program, and an exam reader for the College Board – says,“earning a score of 5 is the equivalent to an Intermediate High rating from ACTFL (the American Council on Teaching of Foreign Languages), and means a student would have the capabilities to use the language spontaneously in real world situations that can involve some complexity. How popular is the AP Chinese Language and Culture Exam? 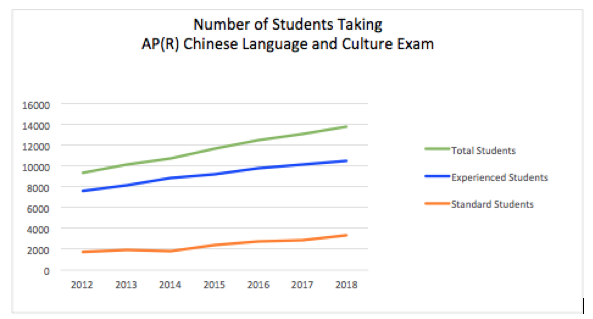 The AP Chinese Language and Culture exam has been gaining in popularity in recent years, and is now the third-most popular AP language exam after AP Spanish and AP French. From 2012 to 2018, AP Chinese test takers increased 48%, with nearly 14,000 high school students completed the AP Chinese exam in May 2018. The College Board shares data on the total number of students, and the number of standard students, who are defined as students not regularly hearing or speaking Chinese at home, and who have not lived in a Chinese-speaking country. From 2012 to 2018 the number of standard students taking the exam nearly doubled. When is the AP Chinese Language and Culture test administered? How much does the exam cost? Most AP exams are administered during a two-week stretch in May each year, after a high school student has completed two semesters of AP course study in the subject. This year, the AP Chinese Language and Culture Exam falls on Monday, May 6, 2019 at 12pm local time. In 2019, AP exams cost $94 per test. Students and their families may qualify for AP exam fee reductions and federal and state assistance. How is the AP Chinese exam administered? 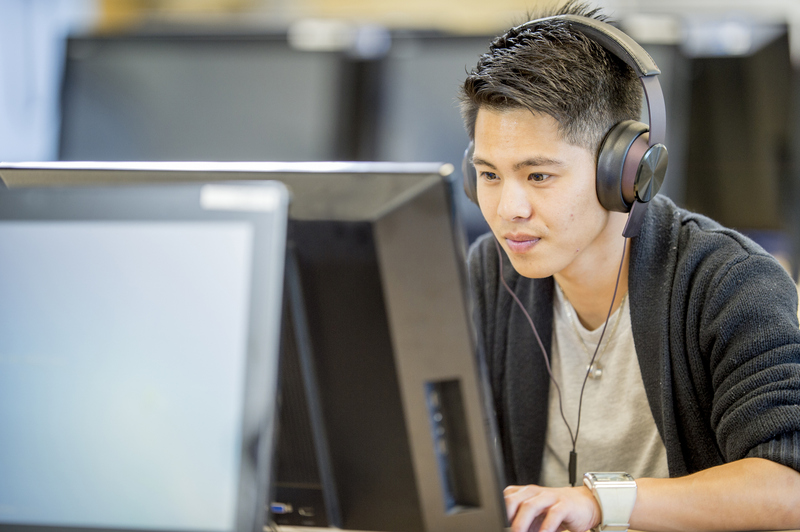 Unlike many other AP tests, the AP Chinese Language and Culture exam is administered on a computer. Students will read text, listen to recordings through headphones, type Chinese on their keyboards and speak Chinese into a microphone. Students have a choice about how to display the Chinese text characters they read, and the method they use to type on the computer. Their choice does not affect their grade in any way. Students have the option to toggle between traditional or simplified characters at any point in the exam. Students will be given a choice of typing options at the beginning of the exam. If they choose to use the Pinyin input method, they can choose whether they want to type their responses in simplified characters or traditional characters. If they choose to use the Bopomofo input method, they don’t have to take action at the beginning of the exam. The exam proctor will help them with that. 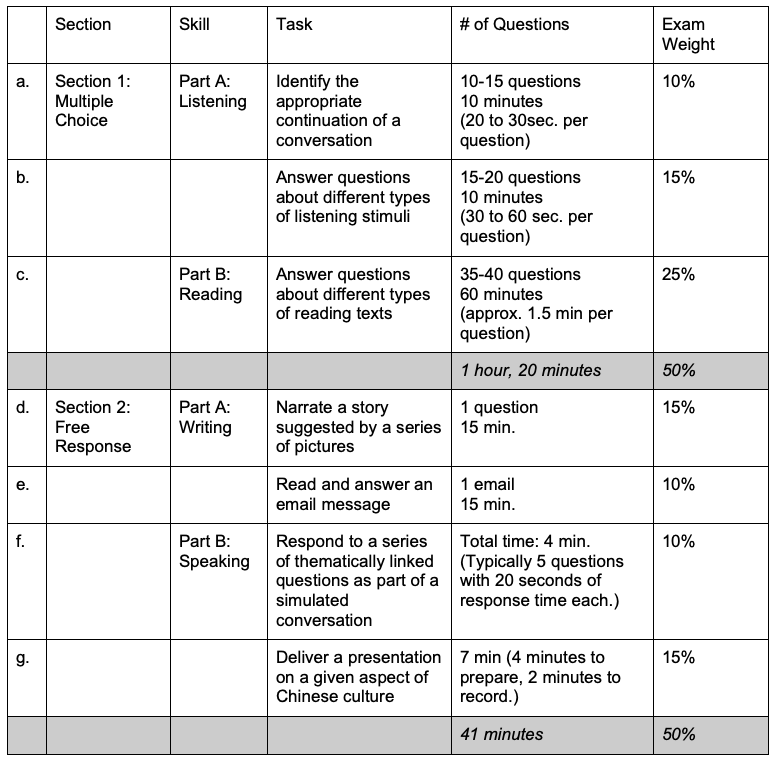 What are the components of the AP Chinese Language and Culture Exam? The AP Chinese test consists of 4 distinct portions which cover skills in listening, reading, writing and speaking. The exam is approximately 2 hours and 15 minutes long. How Do Students Do on the AP Chinese Language and Culture Exam? 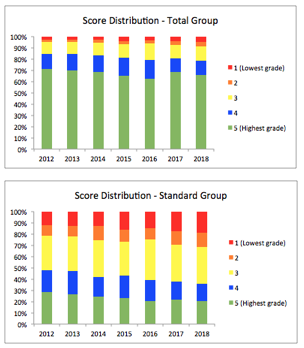 Each year, the AP College Board releases score distributions, displayed as the total group and the standard group. While the total group reflects the score distribution for all test-takers, the standard group does not include students who hear or speak Chinese at home, or who have lived for one month or more in a country where Chinese is the native language. Unless your student regularly hears Chinese at home, the standard group is the best metric. The data from the College Board show that amongst the total group, 66% of AP Chinese exam takers scored a 5 in 2018. Amongst the standard group, 20% of students scored a 5. The data also show that the percentage of standard group students scoring a 5 has decreased 8 points since 2012, while, as mentioned earlier, the number of standard group students taking the exam nearly doubled. Again, the standard group students, who have not had significant exposure to Chinese outside the classroom score lower than the total group. Being ready for the AP Chinese exam includes understanding what each different section of the exam is looking for. Here we’ll go into detail about each question type and offer tips for maximizing your score. What to expect: The prompts are usually between 20-30 seconds each, which will be spoken in a moderate speed within a quiet background setting. Conversation topics are closely related to daily life. Past conversation topics on the AP Chinese exam include: visiting a friend, talking to a parent, meeting a new friend, talking to a teacher at school, etc. Students can only listen to all the prompts in this part once and will only have 5 seconds to answer each question. There will be a volume button on the top right of the screen that students can click to adjust volume. When the time expires, the exam automatically moves to the next task. Students cannot return to the previous task once it is completed. How to maximize your score: The multiple-choice section is straightforward in this regard — exam-takers should listen and read carefully, and choose whichever answer seems most appropriate to them. Points are not subtracted for incorrect answers, so don’t leave a question unanswered. Listening for key words and the stress of tones will help students find the correct answer. “Students will find it useful to take proper notes in this section. Important information that is worth writing down can be numbers, time, dates, key words and main ideas from the context.” Leona Lu, PandaTree tutor. What to expect: In this part of the listening exam, some of the prompts will be played twice, while others will be played once. It depends on the length of the prompts. Past topics on the AP Chinese exam include listening to a voice message, a report or a note, a narration, and a school conversation, etc. How to maximize your score: This part of the listening assesses the knowledge of students’ interpretive communication and comprehension, ability to draw inferences, and ability to apply basic cultural knowledge. Students cannot return to the previous task once it is completed so don’t skip any questions. You won’t be penalized for incorrect answers, so if you aren’t sure make your best guess. What to expect: Students will answer multiple choice questions after reading a variety text passages. Past types of text stimuli have included a public sign, poster, e-mail, note, letter, advertisement, brochure, or article. Usually the last passage is most challenging, for example, a celebrity’s biography or an analytical article from a Chinese newspaper. How to maximize your score: Students should carefully read the questions and choose the best answer. Test-takers shouldn’t agonize over difficult ones, but rather move on quickly and come back to any that give them trouble. And don’t leave any questions blank. What to expect: Students will read an email from a friend first and then type a response in an allotted time(15 minutes). Usually, students will be asked to exchange personal opinions, help a friend solve a problem or a conflict. The topics will be closely related to students’ daily life. Past topics on the AP Chinese exam include a college application, job interview, sports choices, traveling experience and tips, summer/winter break activities, etc. What to expect: The writing section of the AP Chinese exam accesses students’ presentational writing ability and interpretive communication skills. Story narration is presentational writing. 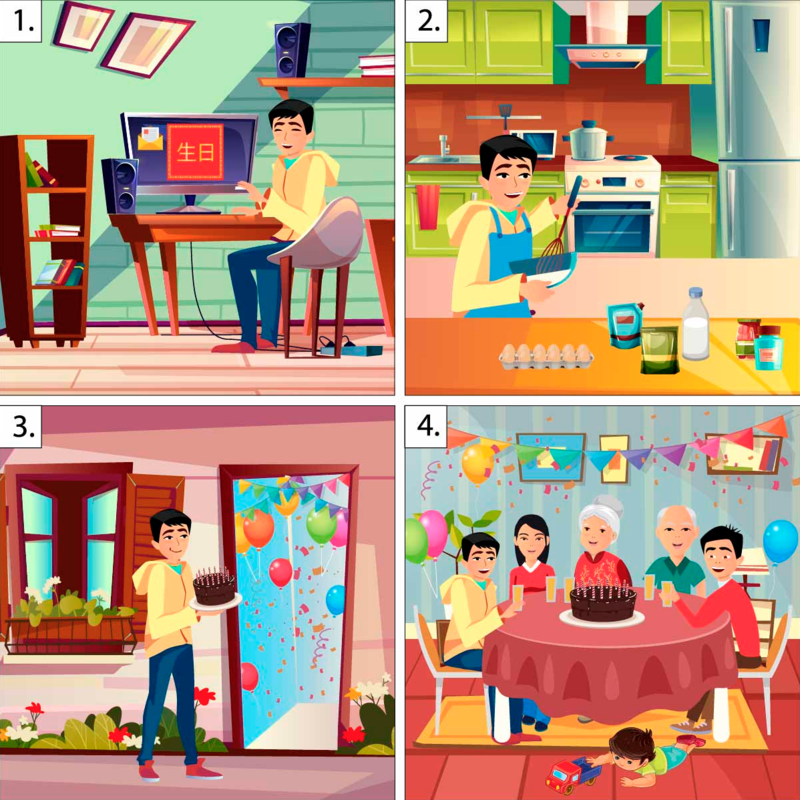 Students will have 15 minutes to write a story according to a four-picture set of prompts. Students should include all the picture, narrate the story as completely and logically as possible. Well-connected discourse of paragraph length. According to the AP Chinese test graders of 2018, one of the most common mistakes was that test takers didn’t always answer the question in full or describe a cohesive series of events — task completion is the highest priority! Students studying for the exam should also practice typing Chinese on a computer (to minimize typing and character selection errors). An example of a story narration practice question that PandaTree students might use with their tutors. What to expect: Students will be engaged in a conversation and are expected to understand the scenario established by the spoken prompts. The prompts are spoken in a moderate speed, a bit slower than a daily conversation. Past topics have included: interviewing for a job, sharing experiences about a trip to China, asking for help for homework, talking about a college application and planning a surprise birthday party for a friend or teacher, etc. Responses demonstrate a rich and appropriate vocabulary and idioms, including a wide range of grammatical structures; minimal errors are acceptable. According to the AP Chinese exam graders of 2018, while most students successfully demonstrated comprehension and speaking skills, not all test takers used the register appropriate to the situation, showing a lack of cultural awareness. According to Jing Feng, an AP Test Prep tutor with PandaTree, “proper register choice is key to a score high in this section. For example, in the 2018 exam, students are asked to talk about a birthday party for an elderly Chinese neighbor that they attended in the past weekend. When being asked a question of “你对王奶奶都说了些什么？” (“What did you say to Elder Wang?” ), a proper answer could be: “您好，今天是您的生日，祝您生日快乐，福如东海，寿比南山。” (“Hello, today is your birthday. Wish you a happy birthday, boundless happiness and a long life.”) Students should be using the respectful form of “you” and the proper idiomatic expressions when talking to an elder person. What to expect: Students will make a cultural presentation based on the given topic in limited time. This part is to access students’ speaking ability in the presentational mode of communication and cultural knowledge. Students are expected to know all kinds of cultural aspects including traditional Chinese culture and customs, modern Chinese lifestyle, education and school systems, family and society, literature, arts and philosophy, etc. Language use is rich and appropriate with minimal errors. 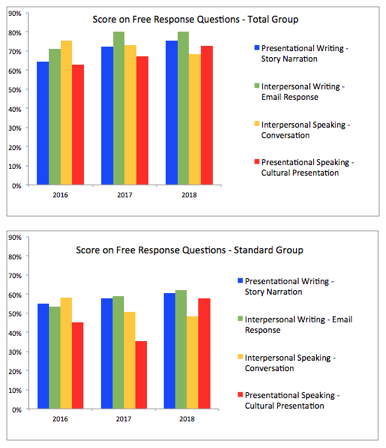 According to the AP Chinese exam graders of 2018, most responses integrated the skills required to complete this presentational communication task while some responses did not address all aspects of the prompt even though they demonstrated very advanced language skills. Some responses focused on the description of a change to a cultural practice but did not discuss its significance. This may be due to a lack of careful reading of the prompt or lack of training in explaining the significance of a cultural change. Now that you know what the AP Chinese exam covers, and you’re armed with some strategies for each type of question, what’s the best way to prepare? Take the high school AP Chinese course: This course, offered in thousands of high schools in North America is specifically designed to prepare a student to succeed on the AP Chinese Language and Culture test. Get comfortable with the technology and timing: The exam isn’t just testing if you can answer an email in Chinese, it is testing if you can type a response in 15 minutes. Practice under as realistic conditions as possible so you know how to pace yourself on the exam. Practice test-taking skills with PandaTree tutors: PandaTree offers one-on-one tutoring with AP-experienced teachers. Prior to the lesson, students complete a practice section of the test, which the tutor will grade. During the lesson, your PandaTree tutor will provide feedback and coaching. This kind of one-on-one tutoring allows a tutor to identify key areas for improvement and accelerates student progress. Just 9,141 students scored a 5 on the AP Chinese Language and Culture exam last year. Writing and scoring well on the AP Chinese Language and Culture exam is a significant achievement. After all, just 9,141 students scored a 5 last year – making it a distinctive accomplishment. And Chinese is widely recognized as one of the more challenging language for English speakers to master. So beyond the exam, achieving a high level of fluency in Chinese opens doors for the future. Laozi, an ancient Chinese philosopher and writer once said, “The journey of a thousand miles starts with a single step.” (千里之行，始于足下。）Success is accumulated step by step. With AP-experienced tutors and realistic practice tests, PandaTree is here to help you on the journey. College Board, Advanced Placement and AP are trademarks registered by the College Board, which is not affiliated with, and does not endorse, this site.